Completely revised and updated, Human Herpesviruses HHV-6A, HHV-6B & HHV-7, Third Edition, delivers a contemporary and thorough review of HHV-6, beginning with foundational explorations of classification, molecular biology, and chromosomal integration of the virus, through to clinical details, including pathologic features of infection, and clinical effects on various organ systems. The work now includes coverage of HHV-7, a virus that remains underestimated in transplant reactivation, seizures, and encephalitis. The book examines the role of HHV-6 in myriad diseases, including cognitive disorders following bone marrow transplant, mesial temporal lobe epilepsy, multiple sclerosis, autoimmune disease, encephalitis, Hodgkin's disease lymphoma (HHV-6B), and glioma (HHV-6A). Descriptions of current and novel molecular and serological diagnostic assays, along with detailed protocols, are included to aid researchers and clinicians in discriminating potential false positives originating from chromosomally integrated HHV-6, and in differentiating between active and latent infection. 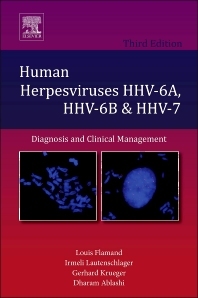 Human Herpesviruses HHV-6A, HHV-6B & HHV-7, Third Edition is a valuable reference for both clinical and basic scientists, including epidemiologists, virologists, practicing clinicians, infectious disease specialists, pathologists, and all scientists entering the field of herpes virus research. The work is a practical and thorough resource for a foundational understanding of HHV-6 and HHV-7, while providing a cutting-edge translational and clinical reference to those looking to understand and diagnose associated viral diseases. Clinical and basic scientists including epidemiologists, virologists, practicing clinicians and infectiologists, pathologists and essentially all scientists entering the field of herpes virus research. Professor of Pathology and Laboratory Medicine, The University of Texas, Houston Medical School, U.S.A.
Scientific Director, HHV-6 Foundation & Adjunct Professor Microbiology, HHV-6 Foundatiton, Santa Barbara, CA, U.S.A.